Perhaps Bill Gates thought he owned that concept, but here's a band that truly 'surfs' the limitless realm of possibilities in artistic creativity. And whoever shows up that particular day, they get to hop onboard and join the fun. Needless to say, the 'membership' of Mushroom is a grey area, an ever-shifting collective of friends and acquaintances in the San Francisco Bay area. Usually centered around drummer Patrick O'Hearn and guitar/flute/sax-player Erik Pearson. But beyond that, the remaining cast varies with constant regularity. In their short existence (since 1996), the output from Mushroom has been quite frequent and diverse, turning up on record labels all over the place, and never the same place twice. That fits right in with the style of the band, always experimenting, never hinting at any predictable pattern. The closest thing the band has to a modus operandi is a tendency towards settling into a rhythmic trance, a foundation of rumbling, tumbling cadences á la the hypnotic krautrock of Neu! and Can. But above this, the lead instruments are always free to play amidst the stars however they see fit. The resultant recordings are frequently cosmic gems, ones that I imagine convey as much a sense of discovery to the listener as to those creating the music. We reviewed 'Hydrogen Jukebox' for you last time (AI#6), but already they've released 'Analog HiFi Surprise' in Germany (soon to appear also in the states). The album opens with "The Magic of Michael," perhaps the freakiest Mushroom tune ever. Apart from the analogue synth bleepings, the source of the other crazy lead lines are hard to determine... is it guitar or keyboard? I'm not sure. A similar feel continues in the excellent "Rackets," this one having far more bass movement than you'd guess, but the best parts are the 'snake' guitar lines looping around the 'dial tone' effects which kind of act as additional counter-percussion. "October 1970" is an experimental piece with delayed Mellotron sounds, flute-like textures, and some 'howling dog' samples. An effective linking device. Fast drumming and chunky bass kick off "Our Buddy Miles" which lays the foundation for a whole slew of 70's-style tricks - the 'wokka-wokka-wokka' guitar chopping, the rich Rhodes piano sounds, and a mix of wah and feedback guitar during the extended solo section. Never a dull moment. After an even looser jam with too many parts to name, the band then segue into the slightly more structured tune entitled (are you ready for this?) "The Evolution of Smells in an Underground Parking Garage After an All Night Rave." Another major highlight, the groovy bass, the sax, and the sliding/gliding guitar all give the tune a Gong-ish feel. After nine minutes, the song finally fades out with a graceful flute solo nestled inside a bassy womb. The finale ("Abbie Hoffman") actually features some of the neatest sounds on the album, from boomy to chunky to the concluding space f/x. Though recorded in the same session as 'Hydrogen Jukebox,' the material on 'Analog HiFi' is far more active and frenzied. Rhythmically, there's not that much difference between this music and the first two CD's. However, the vast array of novel sounds here and the multi-multi-layered compositions are impressive. I'm not sure I can rate it against the other Mushroom works...I thought the 'Jukebox' album had a simple beauty and class to it in the spirit of Caravan's 'Grey and Pink.' This is simply a different critter - the music refuses to sit still. So I recommend both. I've talked enough, so let's now discover from which dark, damp cave Mushroom arose, in the words of the band's central member, Patrick O'Hearn. AI: How and when did Mushroom get started? Was it initially a project you began, or did it come together more by chance? PO'H: Our first recording sessions and in fact the first time that all the members met each other or even all played together for the first time was in November 1996. Some of us had worked together before, but never all of the people at once. In fact some of them I had never played with before, but only knew who they were from the local music scene. Anyway, the story goes like this: I had been recording and releasing some singer/songwriter-styled albums in Germany for the past few years and was looking to do something different with the next one. So, inspired by all those early 70's Miles Davis albums I had recently discovered, along with mid 70's King Crimson and a handful of Soft Machine live releases - it was my idea to record a bunch of instrumental songs to put on the CD in between the so called regular songs with lyrics. I never intended to start an all instrumental band, or even a band called Mushroom. What happened next was this: About a week after the sessions, I played one of the versions of The Reeperbahn that we had recorded (at the time, none of the songs had titles) for some friends of mine that own the Mod Lang Record store in Berkeley. Naomi, one of the owners had just started a vinyl-only label, called Belmondo. After only hearing about 4 minutes of this 20 minute song, she asked me if I wanted to release a single. I said sure, but has to be a 12 inch, not a 7 inch to fit this whole song. I had no intention of releasing something like this under my own name, so I quickly came up with the name Mushroom (based on the fact that one of the band members used to sell psychedelic mushrooms in his college days). About 6 months later, this vinyl 12 inch came out, and I decided to do some gigs to support the release of the record and a new band was born. I quickly put my singer/songwriter career to the side. Initially we played many of the songs from the 12 inch and the debut CD at our live shows, but soon we got into mostly doing improv live, just like the studio sessions are. We recorded enough stuff on that first weekend for a few releases! One thing I want to say, although I love Krautrock a lot now, I had not really heard that much Krautrock when we went into the studio for the first sessions. I had heard some Can CDS, and a few Amon Düül 2 LP's, but not any Faust or Neu! or anything else. It was only later, after the first sessions were done, that I heard Neu! and felt a real strong kinship to that music, did I name some of the songs after Klaus Dinger. So, I know it is very hard to believe for anyone who has heard those Mushroom CD's, but the song called Klaus Dinger and also the song (Dinger & Rother visit) The Reeperbahn were recorded before I heard a note of Neu!. I think those recordings were mostly inspired by the concept of Krautrock more than the music itself, as I had read the Julian Cope 'Krautrocksampler' book just before going into the studio. Except for Alec Palao (the bass player) who knew some Can music, no one else in those first sessions had any idea what Krautrock was. Graham Connah, on keyboards is into all kinds of classic jazz, plus Zappa, Santana, and Sun Ra. The guitarists, Erik Pearson and Tim Plowman are inspired by rock: Television, Robert Fripp, Neil Young, etc. Although Erik has many different influences (including classical music) as shown with his flute and sax playing as well. Alex Candelaria, the other guitarist, is into jazz and fusion. AI: I get the feeling that the basic tenet of Mushroom is to remain independent and spontaneous, unhindered by any long-term strategy. And I get that impression from both the music itself as it changes from album to album, and also from the releasing of four albums on four different labels. Do you have *any* set strategies of any kind? PO'H: Rule one is to remain independent and spontaneous, and most importantly, never, never repeat yourself on CD. Never make the same album twice. The Hydrogen Jukebox CD and Analog HiFi Surprise CD, which were recorded at the same time, sound like two totally different records. And the song Leni Riefenstahl, which is basically side one of the Aether limited vinyl LP, also sounds totally different from the 2 CDS, although it was done at the same session. That is the #1 lesson that I learned from Miles Davis: never repeat yourself. Bob Dylan and David Bowie have also done that to a slightly lesser degree. I also started carrying that over to our live shows. Sure, I change 1 or 2 band members from show to show sometimes (but not every show), but even when the same guys play for 2 or 3 shows, each of those shows will have a totally different vibe. One night, it could be Canterbury styled jazz rock. The next week, the same guys are playing in a spacerock groove. The next time around, more of a Krautrock thing. And I stress, this is not something planned in advance. I do not say to them, Ok, tonight guys, let's be Caravan, and then the next night, let's be Neu!. It is a very natural thing, it depends on many things: the vibe of the club, the way the musicians feel, and of course the actual line-up of the band has something to do with it as well. But that is why I love playing with Mushroom more than anything else I have done before. And also why I love listening to Mushroom. Most bands of any genre... rock, folk, jazz... find a sound and stick with it. They work on developing songs. Mushroom is into developing styles, I never get bored playing or listening to the music because the style of the band is always growing and changing with every gig. With Mushroom, each night might not be 100% amazing, but I will guarantee you, that you will see something very different in 'feel' than what you heard the last time. Even if the same musicians are on stage each time. And I think it is because I allow my band to have a lot of freedom on stage to do what they want, they also play better! Often with much more intensity than they play in their own bands or in other projects. The only thing I might suggest are tempos or starting off one guy at a time or something like that. AI: When you performed at ProgFest '99, you had a configuration that didn't quite match the lineup on the latest album, Hydrogen Jukebox. Although all of the people were familiar names. How does the transient nature of the lineup influence the individual performances? PO'H: Well, I guess this sort of ties in with the previous question - but at ProgFest, since there was no keyboards, Erik was only playing sax & flute, and we were being told to turn down every few minutes, that show was certainly pushed in a certain direction. Not one of our best gigs, and for anyone reading this that saw that gig, and has not heard one of our CDS, please do not judge us too harshly. It was a fun gig to play, but not one of our more inspired performances. AI: The song-writing credits for Hydrogen Jukebox are band-inclusive (i.e., given as 'Mushroom'), though you are credited as producer/director. So how does a Mushroom track come into being? PO'H: There is a lot of improv. But often I will suggest a drum pattern to work from, or someone else will have a riff or idea. If I want the song to be long, I might say "let's keep this going for awhile," before we start. And often the songs seem to grow from nowhere and take on a life of their own. I give the band direction, but where they take it is their own choice. Then on the tail end, when I mix the material, I get to take direction again by what elements I use in the mix and what I mix out. I actually do not do that much editing and I often mix the songs on the fly, making decisions as I mix. The final editing is really in what I chose to put on which album, what does not get released at all, and how I assemble the songs when mastering them on the computer. AI: Each album I've heard sounds highly improvisational to me, but Hydrogen Jukebox has a quite different feel to it compared to earlier works. I hear a strong contribution from both keyboardists (Graham and Michael) on the recording, particularly a quasi-Canterbury jazz sound. In the organ especially, also strengthened by Erik's flute playing. Was this just the 'flavor of the moment' or is this a sign of an evolving sound that's leading towards some end result? PO'H: Michael was a big influence on the sound of both Hydrogen Jukebox and Analog Hi Fi Surprise. The guy is a real keyboard wiz. So is Graham, but Graham is a much more laid back guy, while Michael will just jam like a maniac. Which I love. The guy is like a white Herbie Hancock circa 1973. The original idea of Mushroom for me was to be very keyboard heavy, and Michael certainly made it that way. Also I loved the idea of having 2 keyboards, like Miles Davis did when he had both Chick Corea and Keith Jarrett in his band! Michael and Graham are nearly as cool in my book. So, yes, having the dual keyboards is leading to something, as we now have a trumpet (played by Jon Birdsong) in the band on many nights, giving us more of that early 70's Miles sound which I love so much. However, I want to point out, that sometimes what you think is flute, is Mellotron. For example, on the song Elliott Smith, Dan Olmstead was not there, Erik was playing guitar and the flute sounds are all Mellotron played by Michael. AI: Many of the base rhythms seem to fit in with the tendencies of the old Krautrock masters, particularly the more hypnotic styles of Neu!, Can, and the like. Is that an interest limited to yourself? And musically-speaking, where are the other Mushroom members 'coming from'? PO'H: As I mentioned before, I am the only real Krautrock fan in the band, with most of the guys not really knowing anything about it. But I have gotten Erik into Can, Neu!, and Cluster. And he already dug Eno (which I now realize is basically British Krautrock). I think I touched on most of other band members influences before, but I should mention that both Erik and I share a strong love of all things Crimson, and Michael Holt brought in a whole new set of influences into the band, from Supertramp to Coltrane. Dan Olmstead, who replaced Tim Plowman, is a bit older than the rest of us, and Dan really comes from the Fillmore West / Quicksilver school of guitar jamming. On a good night, he sounds great. For a number of reasons, Dan is playing with us less now and we have been using Josh Pollock, who reminds me of Tom Verlaine blending Fripp while shooting speed. AI: You seem to enjoy using musicians' names of the past and present for song titles (e.g., Klaus Dinger, McDonald & Giles, etc.). Is that meant to honor those individuals, or is it just a tongue-in-cheek way of saying, 'Yeah, we're influenced by these people, and we're not afraid to say it.'? PO'H: I touched on the Klaus Dinger thing before, which was that we recorded the first CD, then heard Neu!, I thought we sounded similar in places, so I named some songs after Klaus. Now that I know the guy is a jerk and very paranoid, I doubt I will mention him on a CD again. Maybe Michael Rother is the guy I should be trying to hang with? McDonald & Giles is a tribute to those two guys, mainly because I had just rediscovered that LP while naming tracks for Hydrogen Jukebox after mixing it. So most often, I record the song first and name it much later, based on who I am digging at the time. In the case of the song Our Buddy Miles, I had decided before I recorded that song to attempt something that had the fast pace and high energy of the coked up Miles sound of 1973-74. So, I had the title and idea first, then I did the song. Overall I do it for fun and as a to artists I like and respect. People should not read too much into it. AI: You've already got a new album (Analog Hi-Fi Surprise) in the works. What should we expect from this one? PO'H: Every artist claims that their newest album is the best thing they have ever done, the album they always wanted to make, blah, blah, blah, etc, etc. Well, no need for me to change that tradition now, I feel that Analog Hi Fi is our best CD to date. And I have a gut feeling that you will say the same thing in your review. I think the songs and musicians really came together well on that collection of songs. And I think it really is the best example of what I had in my mind when I first put Mushroom together. It is heavy on the keyboards, á la Herbie Hancock & Brian Auger. I love Erik's saxophone playing, which reminds me of Chris Wood of Traffic on those later period Traffic LPS. There is the Miles Davis feel on some songs of course. Also sort of a Soft Machine 3rd feel as well. I am curious to read what you say about it. I am very happy with it. But also I think my comments make the CD sound too jazzy. There is a spacerock and psychedelic element going on for sure. AI: You're keeping very busy it seems, as Mushroom and Gong's Daevid Allen have just released the excellent debut 'University of Errors' album. Where did you first meet up with Daevid, and what was the impetus to start this new project? PO'H: Until last September, I knew very little about Daevid or his music. Sure, I knew who Gong were, but only had 2 CD's. Daevid needed a place to stay for a week, so our mutual friend Michael Clare brought him to my place. We then had some drinks and discussed improv music. I told him about Mushroom and invited him to play with Mushroom at the end of the week at a gig. None of the Mushroom guitarists could make it, so Daevid became the only Mushroom guitar player for that night. The next day, Michael Clare, who plays bass, suggested that the three of us: Daevid on guitar, Michael on bass, and me on drums go into a recording studio to jam. Daevid invited Jay Radford to play as well on some songs, and Allison Faith Levy (who is a sometime Mushroom keyboardist and singer) suggested that I invite Josh Pollock, who I had never met to play with us in the studio, since she could not make it that day when I called her to play with us. So, we went into the studio, the 4 of us, sometimes 5, and just jammed Mushroom style! All improv, all instrumental, no words. Daevid went back in the next day, and using words he had laying around, did some quick one take vocals over the top. It sounds like we had written and recorded the songs over a period of weeks. The vocals fit the songs perfectly. Daevid gave us the tapes, and Michael and I spent the next few months mixing and remixing until we got something together that everyone liked. Then Daevid did the final editing and assembly in Australia. To be honest, I like the album, but Daevid edited many of the songs down. Some of them are much shorter than they originally were, some of the jamming has been cut out of them, which may or may not be a good thing, depending on your taste. I prefer the jamming, and I love the fact that when we play live that Daevid encourages us to jam, so the live show is closer to my final mixes than the actual CD that was released. But both are cool. It was a very interesting and inspiring project to be part of, and I have learned a lot from playing and hanging with one of the masters. Just to complete the Mushroom connection, I asked Erik Pearson to play flute on one song while we were mixing it, and then convinced Daevid to let Erik join the band as well for the live shows and future recordings. Erik is totally my right hand man, and while Mushroom is my band in a lot of ways, I could not imagine a Mushroom or being in a U of Errors without him. The man is an essential part of my life. AI: I notice the U. of Errors will be doing a series of west-coast dates in late July. Do you have any other touring plans for either Mushroom or U. of Errors in the near future? PO'H: Mushroom now has a record deal with a label called Clearspot in Germany. They released Analog Hi Fi Surprise in Germany, while Innerspace released it in America. Clearspot is part of a bigger company called EFA, who have been nice enough to extend us some tour support money, so we can tour Germany and the rest of Europe in November. Also, we have been selling a fair amount of CD's in Europe already, based on our first 2 CD's being released over there. I do not think you will see a Mushroom tour of the USA anytime soon, unless we start selling more CD's here. However, there is talk of a U of Errors tour of the USA in September, including some east coast shows. 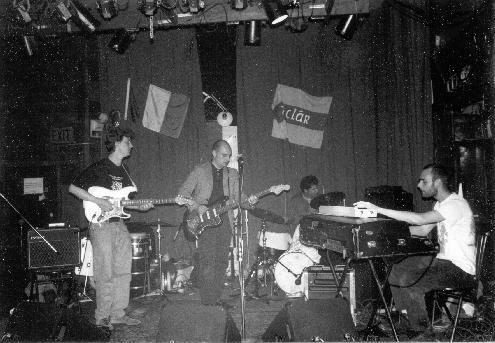 AI: San Francisco has always had a very vibrant music scene, especially in the psychedelic and experimental veins. Have you developed any relationships with these other artists, and in what ways does that help your 'cause' (or theirs) as it were? PO'H: Well, I love all the old bands: Moby Grape, Airplane, the Dead, etc - and have met some of them, but never played with any of them. At one point, there was talk of Peter Lewis of Moby Grape touring Germany with me a few years ago, but his German label refused to back the tour with any money. And then the whole thing got canceled. I think many people who listen to indie rock or younger people (that are not already Deadheads) see the old San Francisco movement as some kind of joke. At the same time, I would like to have more support from the old veterans of San Francisco (both musicians and older music fans) for Mushroom. In terms of bonding with musicians my age, my peers, Mushroom has done some shows with Beyond-O-Matic, and we plan to do more work together in the future, including the Innerspace label possibly doing distribution of their releases. There is also a great band here called Out In Worship that have a few CD's available and also seem to share my fixation with early 70's Miles. I would like to see more of a bond of like minded musicians (and fans) here in the Bay Area spacerock & fusion community. For example, last year, we did a well attended show of about 200 people playing with Kevin Ayers. Mushroom played a set of our own stuff, then we back up Kevin on 90 minutes of Kevin and Soft Machine classics. Everyone seemed to like Mushroom and there was some good feedback on the Web about our own set of music, but I never saw more than a handful of these 200 people at any Mushroom gigs later on. Of course, I would not expect all of them at a Mushroom show without Kevin, but I would think some of them would have liked to see us again later. But I never saw most of them again. Come on people, let's support some of the new blood out there! PO'H: That is because I tend to steal the concept of older bands, not their actual riffs and music, so that keeps our sound fresh and modern. We are not trying to recreate 1960's & 70's music, merely carry on the feel and spirit. There is a difference. AI: I am always optimistic that entire new genres of music are still waiting to be 'discovered,' and I think that starting from where the German artists left off in c. 1975 isn't a bad way to start looking. PO'H: Well, when I first heard 1970's Miles a few years ago, and then all the Krautrock stuff soon after, I really felt inspired. I felt reborn musically. So, I agree with you that Mushroom has sort of picked up the torch in some ways. That is the reason I had the Brain Records logo revamped for Timothys Brain Records. And it was cool of those guys at Timothys Brain Records to let me do that. Also they have turned me on to some incredible music, as have the guys at Aether Records. I now have upwards of about 500 Krautrock CD's, and have discovered some amazing music, besides the bands like Can, Neu, Faust, etc. that everyone already knows. Those well known bands are just the tip of the iceberg, there is some other great stuff out there: Satin Whale, Agitation Free, Xhol Caravan, Embryo, Ash Ra, Brainticket, Et Cetra, Wolfgang Dauner, Kollektiv, Os Mundi, and Gäa to name just a few of the German bands I have gotten into in the last few years. The Crack In The Cosmic Egg book is always open and available at my house. I use it more often than the telephone book. PO'H: Well, I do feel some connection to what Tortoise is doing, I would like them to hear what I am doing, and possibly work with some of them someday. I do not look up to them as my heroes or inspiration, in fact I do not actually own any of their CD's. But I think what they do is cool, although I actually prefer their off-shoot band Isotope 217, which I do listen do around the house. Again, probably because of their Miles like feel. I think people that listen to bands like Tortoise, Stereolab, Air, etc would also like Mushroom. There are some similar ideas happening. Post rock is kind of a dumb term I guess. I think Mushroom is a lot more edgy and intense than some of our post rock peers. I also feel a connection to some of the new jazz rock fusion bands, especially a band called Medeski, Martin & Wood. I saw them play on TV one night and it reminded me a lot of Mushroom, although we tend to get more wild on stage than they did. I would love to share a bill with them some night. AI: Finally, do you have a 'goal' as a musician through any or all of your projects? I don't mean financially, but rather artistically or expressively. Is there a message in Mushroom's music? PO'H: I think after years of playing music in a number of sounds and styles, sometimes as a singer and sometimes a drummer, I feel like I have finally hit my stride. Mushroom is the most natural and relaxed, yet also the most intense music I have ever done. A friend of mine, who has been following my musical path since 1984, said to me recently that Analog Hi Fi Surprise is the best thing I have ever done. Again it sounds corny and obvious, but I really feel that way as well. The message in Mushroom music is what I said in the beginning of this interview: never make the same album twice and try to do something different every time you get on stage. The Reeperbahn LP 1997 Belmondo US ??? (as yet untitled) LP 1999 Aether US ?? ?